As the two major political parties are locked in a high-stakes political imbroglio that has resulted in a government shutdown and may cause the first-ever default on the national debt, Americans are more likely to view both parties negatively than positively. The Republican Party is clearly taking a bigger political hit from Americans thus far in the unfolding saga, with 28% rating the GOP favorably — a loss of 10 points from only a month ago. This contrasts with previous Gallup findings from just before the government shutdown showing the Republican Party making up ground on a few key issues. Thus, the Republican Party’s current strategy in the fiscal debates may not be paying dividends. 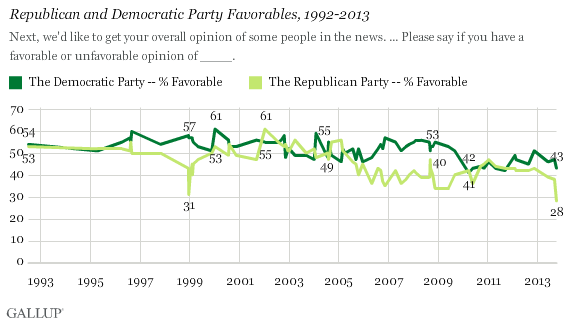 For their part, the Democratic Party has also seen its favorability rating drop since September, though by a smaller four points. Moreover, both parties are down from where they were just after the 2012 elections, indicating the many political battles of 2013 have had a corrosive effect on the two parties’ images. AP also found that the Republicans are receiving more of the blame for the shutdown. Democrats lead the generic Congressional ballot 46/41, including a 42/33 lead with independents. Independents have shifted 21 points on the generic ballot from July when Republicans had a 39/27 advantage with them. The lean toward Democrats for next year reflects who they blame for the shutdown. By a 51/37 margin they say Republicans are more at fault than Democrats, and by a 57/41 margin they think Congress is more to blame than the President. Unfortunately, even if Democrats can maintain a five point edge in the generic ballot, this would not be enough for the Democrats to take control of the House. Posted in Congress, Democrats, Politics, Polls, Republicans. Tags: Congress, Democrats, Polls, Republicans. RSS feed for comments on this post.. TrackBack URL.